Wendy McElroy is ready for most doomsday scenarios: a one-year supply of nonperishable food is stacked in a cellar at her farm in rural Ontario. Her blueprint for survival also depends upon working internet: part of her money, assuming she needs some after civilization collapses, is in bitcoin. Across the North American countryside, preppers like McElroy are storing more and more of their wealth in invisible wallets in cyberspace instead of stockpiling gold bars and coins in their bunkers and basement safes. They won’t be able to access their virtual cash the moment a catastrophe knocks out the power grid or the web, but that hasn’t dissuaded them. Even staunch survivalists are convinced bitcoin will endure economic collapse, global pandemic, climate change catastrophes and nuclear war. At first glance, it seems counter-intuitive that some of bitcoin’s most ardent proponents are people motivated by the belief that public infrastructure will collapse in times of social and political distress. Bitcoin isn’t yet widely accepted as a method of payment and steep transaction costs make it inconvenient to use at vendors that do take it. Preppers, as it happens, have a different perspective on what they see as the money of the future, which has surged 10-fold in the past 12 months as supporters lauded it as a digital alternative to rival the dollar, euro or yen. Used to send and receive payments online, bitcoin is similar to payment networks like PayPal or Mastercard, the difference being that it runs on a decentralized network—blockchain—that’s beyond the control of central banks and regulators. It was born out of an anti-establishment vision of a government-free society, a key attraction for those seeking unhindered access to their capital in case a massive shock shuts down the banking system. The buzz is starting to impinge on gold’s role as a store of value especially since, like the precious metal, there’s a finite supply of bitcoin, which proponents say gives it anti-inflationary qualities. Sales of gold coins from the U.S. Mint slid to a decade low in the first three quarters months of 2017. To attract investors who traditionally buy gold, several digital assets, like Royal Mint Gold and Anthem Gold, have been developed that are backed by physical gold stored in vaults. “I doubt bitcoin is a safe haven from an extreme-risk environment. In that sense, bitcoin isn’t gold,” said Charlie Morris, the London-based chief investment officer at Newscape Capital Advisors Ltd., which invests in cryptocurrencies and is building a price-discovery platform for them. Bitcoin has also not reached the critical mass to be considered a viable currency to invest in, UBS Group AG’s Mark Haefele said in an interview. The total sum of all cryptocurrencies is “not even the size of some of the smaller currencies’’ that UBS would allocate to, he said. Preppers, though, stock enough food and supplies to sustain them for months, if not years, and they expect whatever governing structure emerges post-calamity will prioritize getting the web back up and running. Interest in cryptocurrencies has started permeating the mainstream. When Morris surveyed hundreds of executives attending the London Bullion Market Association’s annual conference last month, one in 10 said they’d rather own bitcoin than gold following a nuclear war. Along the fringe, the 20,000 libertarians expected to converge on New Hampshire as part of the Free State Project are also switching from precious metals. They like bitcoin because it isn’t created by a government, unlike conventional currency. Whatever doom-and-gloom scenario unfolds, McElroy, from Canada, has faith in bitcoin. She’s writing a bookcalled Satoshi Revolution, inspired by the pseudonym of the person or people who created bitcoin in 2009 as an answer to the financial turmoil wrought by the global financial crisis. She says the digital currency breaks society’s dependence on a state that uses its monopoly over the issuance of money to dominate the economy, making it a natural hedge against disaster. As Mike Novogratz tries to bring some kind of institutional backing to the cryptoasset industry at one end of the market, at the other end, traders and speculators looking to make a quick buck continue to run riot. The latest a high dubious offering comes from management company, SYMM, which has recently announced the launch of new a cryptocurrency investment fund, offering a uniquely new commission structure to investors. The fund will pay monthly dividends equivalent to 50% of trading profits in Ethereum with the remaining 50% reinvested and investors are able to pick up the buyback option at any time. In order to mitigate volatility, the fund will keep 10% of its assets in flat currencies (US$/€). Management fees are “competitive” and charged on profits at 7.5% for investments over 100 ETH and 15% for under 100 ETH. So far, the bitcoin hedge fund world has been able to get away with almost no regulation but as bitcoin trading becomes more mainstream, it will attract regulators. The CME Group is planning to launch a bitcoin futures contract, which will have to be approved by regulators. And when the contract is approved, there are many funds currently standing on the sidelines that would like to be involved. Indeed, $100 billion hedge fund Man Group recently declared that it would be interested in trading bitcoin if or when the CME product hits the market. This would likely be the first of many entries into the market by mainstream hedge funds. PUT the word Bitcoin into Google and you get (in Britain, at least) four adverts at the top of the list: “Trade Bitcoin with no fees”, “Fastest Way to Buy Bitcoin”, “Where to Buy Bitcoins” and “Looking to Invest in Bitcoins”. Travelling to work on the tube this week, your blogger saw an ad offering readers the chance to “Trade Cryptos with Confidence”. A lunchtime BBC news report visited a conference where the excitement about Bitcoins (and blockchain) was palpable. All this indicates that Bitcoin has reached a new phase. The stockmarket has been trading at high valuations, based on the long-term average of profits, for some time. But there is nothing like the same excitement about shares as there was in the dotcom bubble of 1999-2000. That excitement has shifted to the world of cryptocurrencies like Bitcoin and Ethereum. A recent column focused on the rise of initial coin offerings, a way for companies to raise cash without the need for a formal stockmarket listing—investors get tokens (electronic coins) in businesses that have not issued a full prospectus. These tokens do not normally give equity rights. Remarkably, as many as 600 ICOs are planned or have been launched. This enthusiasm is both the result, and the cause, of the sharp rise in the Bitcoin chart in recent months. The latest spike was driven by the news that the Chicago Mercantile Exchange will trade futures in Bitcoin; a derivatives contract based on a notional currency. More people will trade in Bitcoin and that means more demand, and thus the price should go up. But what is the appeal of Bitcoin? There are really three strands; the limited nature of supply (new coins can only be created through complex calculations, and the total is limited to 21m); fears about the long-term value of fiat currencies in an era of quantitative easing; and the appeal of anonymity. The last factor makes Bitcoin appealing to criminals (although this is even more true of cash) creating this ingenious valuation method for the currency of around $570. These three factors explain why there is some demand for Bitcoin but not the recent surge. The supply details have if anything deteriorated (rival cryptocurrencies are emerging); the criminal community hasn’t suddenly risen in size; and there is no sign of general inflation. A possible explanation is the belief that blockchain, the technology that underlines Bitcoin, will be used across the finance industry. But you can create blockchains without having anything to do with Bitcoin; the success of the two aren’t inextricably linked. Wouldn’t you have regretted paying 20 Bitcoins for a $40,000 car in June 2017 only to see the same 20 Bitcoins valued at nearly $100,000 by October of the same year? People are buying Bitcoin because they expect other people to buy it from them at a higher price; the definition of the greater fool theory. Someone responded to me on Twitter by implying the fools were those who were notbuying; everyone who did so had become a millionaire. But it is one thing to become a millionaire (the word was coined during the Mississippi bubble of the early 18th century) on paper, or in “bits”; it is another to be able to get into a bubble and out again with your wealth intact. If everyone tried to realise their Bitcoin wealth for millions, the market would dry up and the price would crash; that is what happened with the Mississippi and the contemporaneous South Sea bubbles. And because investors know that could happen, there is every incentive to sell first. When the crash comes, and it cannot be too far away, it will be dramatic. As of last week, our assessment of the overall market return/risk profile remains dominated by three factors, the first being wickedly extreme valuations (which we associate with near-zero expected S&P 500 nominal total returns over the coming 12-year period, with the likelihood of interim losses on the order of 50-60%), the second being the most extreme syndromes of overvalued, overbought, overbullish conditions we define, and the third – and the most important in terms of near-term market risk – being divergent and deteriorating market internals on the measures we use to assess investor risk-preferences. It’s important to emphasize that this full set of conditions has been present during only a fraction of the advancing half-cycle since 2009, and that on balance, the S&P 500 has lost value during these periods. Moreover, this is the same set of conditions that allowed us to anticipate the 2000-2002 and 2007-2009 collapses. Investors would do well to understand the distinction between an overvalued market that retains uniformly favorable market internals, and an overvalued market that has lost that feature. I’ve openly detailed our challenges in this half cycle and how we adapted, primarily in 2014 (see Being Wrong In An Interesting Way for a detailed narrative). The central lesson of this half-cycle is not that quantitative easing or zero interest rates can be relied on to permanently support stocks, but rather, that the novel and deranged monetary policy of the Federal Reserve was able to encourage continued yield-seeking speculation long after the emergence of “overvalued, overbought, overbullish” extremes that had reliably heralded steep downside risk in prior market cycles across history. In the face of zero interest rates, one had to wait for market internals to deteriorate explicitly (indicating a shift in investor preferences from speculation to risk-aversion), before adopting a hard-negative market outlook. Even here, an improvement in market internals would defer our immediate concerns about severe downside risk. Presently, however, investors who believe our current defensiveness is simply “more of the same” haven’t absorbed the central lessons of our challenges in the advancing portion of this market cycle, nor the distinctions that could potentially save them from extraordinary market losses over the completion of this cycle. Last week, the Federal Reserve issued a set of Policy Normalization Principles and Plans, by which the size of its portfolio of government securities would “decline in a gradual and predictable manner until the Committee judges that the Federal Reserve is holding no more securities than necessary to implement monetary policy efficiently and effectively.” Essentially, as existing securities held by the Fed mature, the Fed would reinvest the proceeds into new government securities only to the extent that those proceeds exceed “caps” which begin at $10 billion monthly, expand by an additional $10 billion every 3 months, and top out at $50 billion monthly. Recall how the Federal Reserve’s open market transactions operate. When the Fed buys Treasury securities or U.S. government agency securities from the public (it can’t buy them directly from the Treasury, because, see, that would make us look like a banana republic), it pays for those securities by creating bank reserves, which are deposited in the seller’s bank account. The bonds become assets on the Fed’s balance sheet, and the reserves are liabilities of the Fed (as is the currency in your pocket, which you can verify by looking at the top line just above the picture of a President). The sum of currency and bank reserves comprises the “monetary base,” which is the only version of the money supply that the Fed can directly control. In short, when the Fed buys bonds, the Fed creates base money. When the Fed sells bonds (or Fed holdings mature without the Fed reinvesting the proceeds in new bonds), the Fed retires base money. How does this relate to short-term interest rates? Well, historically, neither currency nor bank reserves have earned interest (I’ll discuss a new wrinkle shortly). As the Fed creates more zero-interest base money, some investors decide that they would prefer to hold a closely competing asset that does earn interest; the most similar option being Treasury bills. Those transactions don’t change the amount of outstanding base money or Treasury bills; it just changes who owns them, and at what price. Increasing the size of the zero-interest monetary base encourages some investors to bid up Treasury bills (which drives down the interest rate on Treasury bills), and the process stops at the point where the yield on Treasury bills is just low enough to make investors indifferent between holding zero-interest base money and those now-lower yielding Treasury bills. Put another way, the new level of short-term interest rates ensures that investors, in aggregate, are willing to hold the outstanding quantity of both base money and Treasury bills. Conversely, contracting the size of the monetary base tends to raise short-term interest rates. Economists know this relationship between base money and interest rates as the “liquidity preference curve.” As a practical matter, though, one has to normalize the monetary base by the size of the economy itself, so we find that the actual relationship is between Treasury bill yields and the ratio of monetary base/nominal GDP. 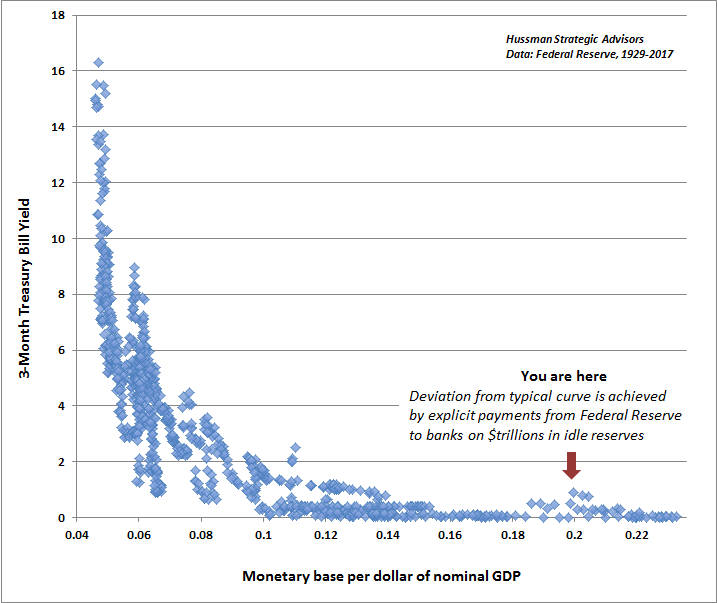 The chart below shows this link; our version of the liquidity preference curve, in U.S. data since 1929. It’s one of the most robust relationships you’ll find in economics. The Fed does not have to make guesses about exactly what is required to normalize its balance sheet, except to the extent that it ignores a century of evidence. Notice the little scatter of points in recent quarters that are slightly above the level one would expect given the current size of the monetary base. These points can exist because the Fed has added a new wrinkle in recent quarters. Because quantitative easing was pushed to deranged (literally de-ranged) extremes, the only way to raise interest rates above zero without immediately cutting the monetary base in half was to explicitly pay banks for holding idle reserves. This new practice of paying interest on reserves is how the Fed has raised rates in recent quarters, without the need to massively contract its balance sheet. One of the risks the Fed is courting here is that if it buys, say, a 7-year Treasury bond, and its average policy rate over the next 7 years exceeds the yield-to-maturity when the Fed bought the bond, it will effectively be engaging in fiscal policy because it will have to pay more interest to banks than the interest it actually receives on the bond, and it would not recover that difference at maturity. This would effectively be unconstitutional, since only Congress can authorize such expenditures through an explicit budget process. It will be interesting to see how this plays out. Currently, there are about 20 cents of monetary base outstanding for every $1 of U.S. nominal GDP. On the subject of “holding no more securities than necessary,” the Fed’s balance sheet remains more than $1 trillion larger than is actually necessary to produce zero interest rates, and is nearly $2 trillion larger than the level that could achieve the current 1% Federal Funds target, without any need to pay banks interest on their idle reserves. Given the extraordinarily well-behaved relationship between short-term interest rates and the ratio of the monetary base to nominal GDP, we can easily estimate the level of interest rates consistent with any particular size of the Fed’s balance sheet. A “static” or steady-state estimate does reasonably well, and requires only the current level of MB/GDP (though the best function is non-linear). One obtains a better fit across history by including the 6-month lagged value of MB/GDP as well, since there is a clear tendency for rates to decline faster than the static estimate when the monetary base is expanding, and to rise faster than the static estimate when the monetary base is contracting. The latest statement from the Federal Reserve suggests a projected course for short-term interest rates reaching 3% by 2019, which would effectively require a 0.25% rate hike roughly every 5 months. Regardless of whether one agrees with that projection or not, it is relatively straightforward to project the size of the monetary base that would be consistent with that final target, without requiring the Fed to pay interest on excess bank reserves (IOER). Below, I’ve included both our dynamic and our static estimates of interest rates that would be consistent, in the absence of IOER, with the normalization plan announced by the Fed (much larger balance sheet contractions would be required to actually reach the Fed’s interest rate projections at each point in time in the absence of IOER). 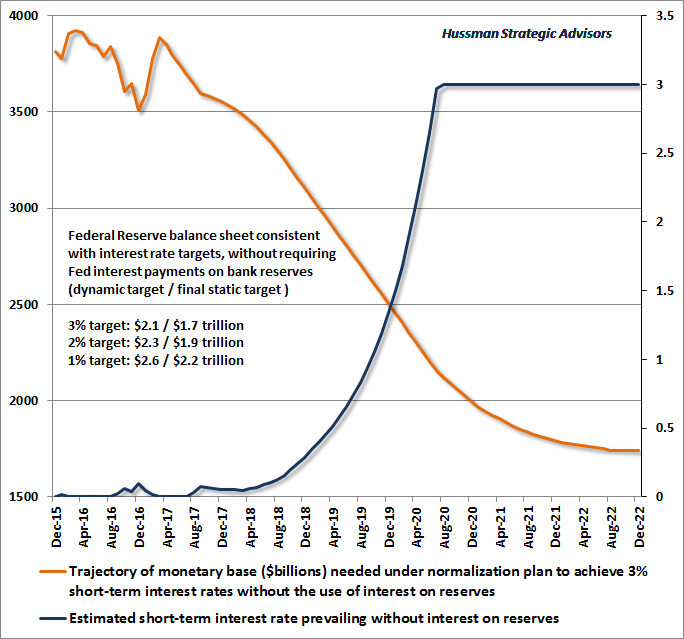 The chart below assumes that the Fed begins its normalization plan in December of this year, and pursues it until the Fed balance sheet is sufficient to achieve a 3% target. I estimate that a 3% target would be reached (using dynamic estimates) in 2020, after which the monetary base would have to continue to decline for a while longer, though at a reduced pace, in order to maintain that target over time. The chart below shows the associated trajectory of the monetary base under a bona-fide normalization plan. 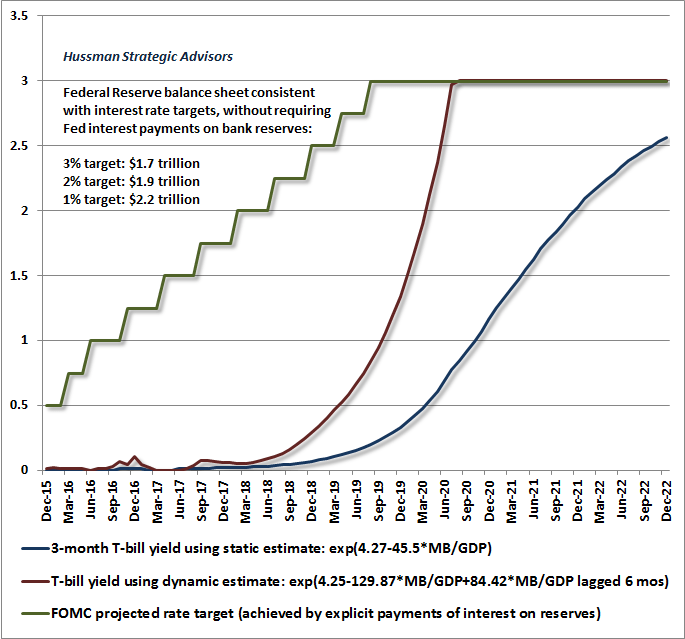 Depending on whether one uses static or dynamic estimates, the monetary base would have to decline from its current level of $3.8 trillion to a range between $2.2 and $2.6 trillion in order to establish a 1% target rate (without IOER); between $1.9 and $2.3 trillion to establish a 2% target rate; and between $1.7 and $2.1 trillion to establish a 3% target rate. If the Federal Reserve maintains a larger balance sheet, achieving those targets would require continued explicit payments of interest to banks on idle reserves, and the Fed would continue to exceed the historical parameters required to implement sound monetary policy. The chart below assumes a 5% growth rate for nominal GDP. Slower growth would require somewhat greater balance sheet contraction to achieve various interest rate targets (without IOER) over the coming years. Frankly, we’re not hopeful that the coming years will unfold gently, not because the Fed will or will not normalize its balance sheet, but because a great deal of damage is already baked-in-the-cake as the result of years of yield-seeking speculation and low-grade credit issuance. If there was clear evidence that activist monetary policy has reliable economic benefits (above and beyond those that can be expected from simple mean-reverting behavior of non-monetary variables like output and employment, which is the entire story of the recovery since 2009), there might be some justification for what the Fed has done. But as I detailed in Failed Transmission: Evidence on the Futility of Activist Fed Policy, despite vapid theoretical diagrams and baseless verbal prose to the contrary, the hard economic data fail to support that view. At some point, perhaps during the next financial collapse, the public may become willing to demand that policymakers support their behavior with systematic evidence of reliable correlations and substantial effect sizes linking policy actions to real economic activity. Instead, we know only one thing for certain, which is that, across history, extended periods of easy money, and the resulting frenzies of low-quality credit issuance and yield-seeking speculation that follow, have regularly unraveled into crisis and collapse. If one repeatedly learns that feeding a beast can briefly appease it, but predictably makes it more enormous, savage, and unstable, it is best to remember the lesson. Instead, central bankers have doomed the world to learn that lesson again. Presently, the most reliable market valuation measures we identify (those best correlated with actual subsequent S&P 500 10-12 year annual total returns) range between 140% and 165% above their historical norms. No market cycle in history, even those featuring quite low interest rates, has failed to draw them within 25% of those norms, or below, implying the likelihood of a 50-60% market decline over the completion of the current cycle. Meanwhile, remember that Fed policy matters little once investors become averse to risk. The combination of market valuations and market internals is the most important feature to consider. It’s clear that, in the recent market cycle, zero interest rate policy was able to sustain yield-seeking speculation and uniformly favorable market internals long after extreme “overvalued, overbought, overbullish” syndromes emerged. That’s a lesson we will not forget. But that lesson is far different from assuming that easy money or low interest rates will support extreme valuations even in the face of divergent and deteriorating market internals. Investors should recognize that in data since 1940 and prior to 2008, U.S. interest rates were at or below present levels about 15% of the time. 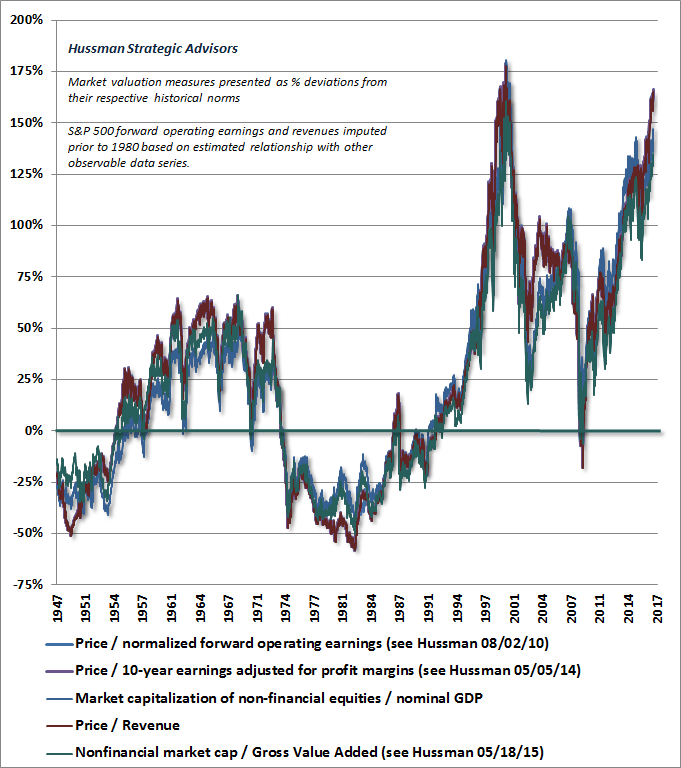 During those periods, the average level of the Shiller cyclically-adjusted P/E was about -50% below present levels, and the average ratios of MarketCap/GVA, MarketCap/GDP and Tobin’s Q (market capitalization to replacement cost of corporate assets) were all about -60% below present levels. That’s roughly the same distance that current market valuations are from post-war pre-bubble norms, even regardless of the level of interest rates. 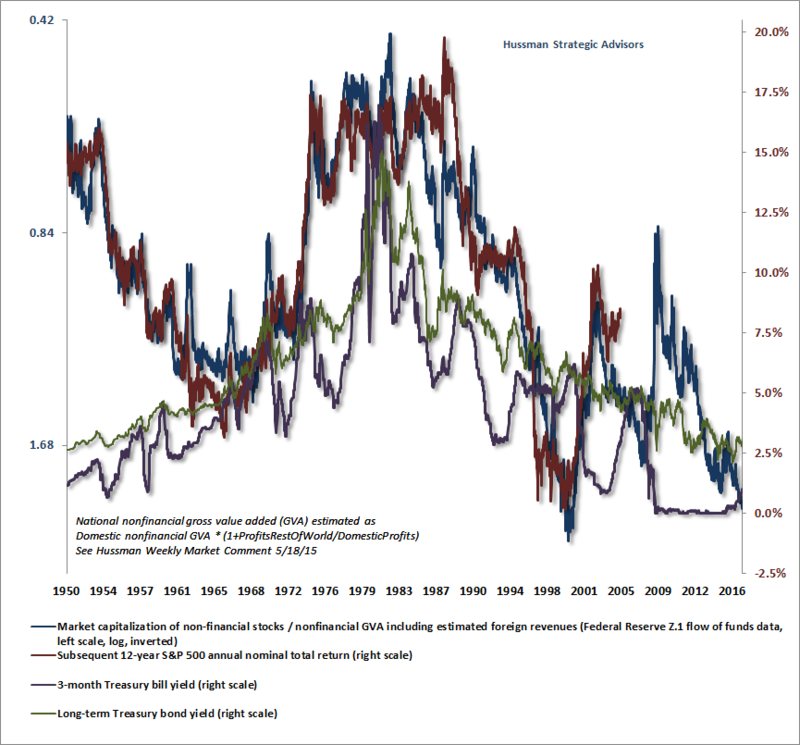 Put simply, investors have vastly overstated the argument that low interest rates “justify” extreme market valuations. Indeed, the correlation between the two is weak, nonexistent, or goes entirely the wrong way in most periods of U.S. history outside of the inflation-disinflation cycle from 1970 to 1998. The chart below is instructive. The blue line (left scale, log, inverted) shows the ratio of nonfinancial market capitalization to nonfinancial corporate gross value-added, including estimated foreign revenues. The red line (right scale) shows the actual subsequent S&P 500 nominal average annual total return over the following 12-year period. The purple line shows 3-month Treasury bill yields. The green line shows long-term Treasury bond yields. The fact that this graph is a chaotic tangle of lines is a reminder that the link between interest rates and market valuations is far more tenuous than investors seem to assume. As I detailed in The Most Broadly Overvalued Moment in Market History, to the extent that investors view interest rates as important, the proper way to factor them in is to first use existing prices and valuations to estimate prospective market returns (an exercise of arithmetic that does not require the use of interest rates), and then to compare those prospective returns with interest rates to judge whether prospective equity market returns are adequate. At present, we estimate that despite their rather depressed yields, Treasury bonds, as well as a sequence of investments in Treasury bills, are likely to outperform the total return of the S&P 500 well beyond a 12-year horizon. That’s a far cry from how stocks were priced between late-2008 and 2012 (see the chart above). If our measures of market internals improve, we would defer our immediate concerns about downside risk, regardless of current valuation extremes. That’s particularly true if market internals were to improve along with a shift back to zero interest rates (which is essentially the lesson of the pre-2014 period). Indeed, an improvement in market action following a material retreat in valuations would likely shift us to a constructive or aggressive position, even if the retreat in valuations comes far short of a reversion to historically normal valuations. Note that all of these possibilities prioritize the behavior of market internals (and the investor risk-preferences they capture) above Fed policy in and of itself. The same prioritization holds versus economic factors, earnings growth, and a host of other variables. I’ll say this once again. Our Achilles Heel in the advancing portion of this cycle was straightforward: in prior market cycles across history, the emergence of extreme overvalued, overbought, overbullish syndromes had an urgency that preceded even the behavior of market internals. Quantitative easing disrupted that regularity. But even since 2009, the S&P 500 has lost value, on average, in periods that joined rich valuation, “overvalued, overbought, overbullish” syndromes, and deterioration in the uniformity of market internals. That’s the combination we currently observe, and our market outlook will shift as the evidence does. Recall that the Fed eased persistently and aggressively throughout the 2000-2002 and 2007-2009 downturns. Once uniformly favorable market internals are lost and investor preferences shift toward risk aversion, monetary policy is not supportive of equities, because safe, liquid money market assets are seen as desirable assets rather than inferior ones. When market internals deteriorate following an extended period of wickedly overvalued, overbought, overbullish conditions, market collapses have typically followed, regardless of the response of the Federal Reserve. Investors should understand that lesson now. My impression is that they are going to need it. Many mainstream economists, perhaps a majority of those who have an opinion, are opposed to tying a central bank’s hands with any explicit monetary rule. A clear majority oppose the gold standard, at least according to an often-cited survey. Why is that? First some preliminaries. By a “gold standard” I mean a monetary system in which gold is the basic money. So many grains of gold define the unit of account (e.g. the dollar) and gold coins or bullion serve as the medium of redemption for paper currency and deposits. By an “automatic” or “classical” gold standard I mean one in which there is no significant central-bank interference with the functioning of the market production and arbitrage mechanisms that equilibrate the stock of monetary gold with the demand to hold monetary gold. The United States was part of an international classical gold standard between 1879 (the year that the dollar’s redeemability in gold finally resumed following its suspension during the Civil War) and 1914 (the First World War). Why isn’t the gold standard more popular with current-day economists? Milton Friedman once hypothesized that monetary economists are loath to criticize central banks because central banks are by far their largest employer. Providing some evidence for the hypothesis, I have elsewhere suggested that career incentives give monetary economists a status-quo bias. Most understandably focus their expertise on serving the current regime and disregard alternative regimes that would dispense with their services. They face negative payoffs to considering whether the current regime is the best monetary regime. Here I want to propose an alternative hypothesis, which complements rather than replaces the employment-incentive hypothesis. I propose that many mainstream economists today instinctively oppose the idea of the self-regulating gold standard because they have been trained as social engineers. They consider the aim of scientific economics, as of engineering, to be prediction and control of phenomena (not just explanation). They are experts, and an automatically self-governing gold standard does not make use of their expertise. They prefer a regime that values them. They avert their eyes from the possibility that they are trying to optimize a Ptolemaic system, and so prefer not to study its alternatives. The actual track record of the classical gold standard is superior in major respects to that of the modern fiat-money alternative. Compared to fiat standards, classical gold standards kept inflation lower (indeed near zero), made the price level more predictable (deepening financial markets), involved lower gold-extraction costs (when we count the gold extracted to provide coins and bullion to private hedgers under fiat standards), and provided stronger fiscal discipline. The classical gold standard regime in the US (1879-1914), despite a weak banking system, did no worseon cyclical stability, unemployment, or real growth. The classical gold standard’s near-zero secular inflation rate was not an accident. It was the systemic result of the slow growth of the monetary gold stock. Hugh Rockoff (1984, p. 621) foundthat between 1839 and 1929 the annual gold mining output (averaged by decade) ran between 1.07 and 3.79 percent of the existing stock, with the one exception of the 1849-59 decade (6.39 percent growth under the impact of Californian and Australian discoveries). Furthermore, an occasion of high demand for gold (for example a large country joining the international gold standard), by raising the purchasing power of gold, would stimulate gold production and thereby bring the purchasing power back to its flat trend over the longer term. A recent example of a poorly grounded historical critique is provided by textbook authors Stephen Cecchetti and Kermit Schoenholtz. They imagine that the gold standard determined money growth and inflation in the US until 1933, and so they count against the gold standard the US inflation rate in excess of 20% during the First World War (specifically 1917), followed by deflation in excess of 10% a few years later (1921). These rates were actually produced by the policies of the Federal Reserve System, which began operations in 1914. The classical gold standard had ended during the Great War, abandoned by all the European combatants, and did not constrain the Fed in these years. Cecchetti and Schoenholtz are thus mistaken in condemning “the gold standard” for producing a highly volatile inflation rate. (They do find, but do not emphasize, that average inflation was much lower and real growth slightly higher under gold.) They also mistakenly blame “the gold standard” — not the Federal Reserve policies that prevailed, nor the regulatory restrictions responsible for the weak state of the US banking system — for the US banking panics of 1930, 1931, and 1933. Studies of the Fed’s balance sheet and activities during the 1930s have found that it had plenty of gold (Bordo, Choudhri and Schwartz, 1999; Hsieh and Romer, 2006, Timberlake 2008). The “tight” monetary policies it pursued were not forced on it by lack of more abundant gold reserves. There are of course serious economic historians who have done valuable research on the performance of the classical gold standard and yet remain critics. Their main lines of criticism are two. First, they too lump the classical gold standard together with the very different interwar period and mistakenly attribute the chaos of the interwar period to the gold standard mechanisms that remained, rather than to central bank interference with those mechanisms. In rebuttal Richard Timberlake has pertinently asked how, if it was the mechanisms of the gold standard (and not central banks’ attempts to manage them) that destabilized the world economy during the interwar period, those same mechanisms managed to maintain stability before the First World War (when central banks intervened less or, as in the United States, did not exist)? Here, I suggest, a strong pre-commitment to expert guidance acts like a pair of blinders. Wearing those blinders, even if it is seen that the prewar system differed from and outperformed the interwar system, it cannot be seen that this was because the former was comparatively self-regulating and the latter was comparatively expert-guided. Second, it is always possible to argue in defense of expert guidance that even the classical gold standard was second-best to an ideally managed fiat money where experts call the shots. Even if central bankers operated on the wrong theory during the 1920s, during the Great Depression, and under Bretton Woods, not to mention during the Great Inflation and the Great Recession, today they operate (or can be gotten to operate) on the right theory. In the worldview of economics as social engineering, monetary policy-making by experts must almost by definition be better than a naturally evolved or self-regulating monetary system without top-down guidance. After all, the experts could always choose to mimic the self-regulating system in the unlikely event that it were the best of all options. (In the most recent issue of Gold Investor, Alan Greenspan claims that mimicking the gold standard actually was his policy as Fed chairman.) As experts they sincerely believe that “we can do better” by taking advantage of expert guidance. How can expert guidance do anything but help? Expert-guided monetary policy can fail in at least three well-known ways to improve on a market-guided monetary system. First, experts can persist in using erroneous models (consider the decades in which the Phillips Curve reigned) or lack the timely information they would need to improve outcomes. These were the reasons Milton Friedman cited to explain why the Fed’s use of discretion has amplified rather than dampened business cycles in practice. Second, policy-makers can set experts to devising policies to meet goals that are not the public’s goals. This is James Buchanan’s case for placing constraints on monetary policy at the constitutional level. Third, where the public understands that the central bank has no pre-commitments, chronically suboptimal outcomes can result even when the central bank has full information and the most benign intentions. This problem was famously emphasized by Finn E. Kydland and Edward C. Prescott (1977). These lessons have not been fully absorbed. A central bank that announces its own inflation target (as the Fed has), and especially one that retains a “dual mandate” to respond to real variables like the unemployment rate or the estimated output gap, retains discretion. It is free to change or abandon its inflation-rate target, with or without a new announcement. Retaining discretion — the option to change policy in this way – carries a cost. The money-using public, uncertain about what the central bank experts will decide to do, will hedge more and invest less in capital formation than they would with a credibly committed regime. A commodity standard — especially without a central bank to undermine the redemption commitments of currency and deposit issuers — more completely removes policy uncertainty and with it overall uncertainty. Speculation about the pre-analytic outlook of monetary policy experts could be dismissed as mere armchair psychology if we had no textual evidence about their outlook. Consider, then, a recent speech by Federal Reserve Vice Chairman Stanley Fischer. At a May 5, 2017 conference at the Hoover Institution, Fischer addressed the contrast between “Committee Decisions and Monetary Policy Rules.” Fischer posed the question: Why should we have “monetary policy decisions … made by a committee rather than by a rule?” His reply: “The answer is that opinions — even on monetary policy — differ among experts.” Consequently we “prefer committees in which decisions are made by discussion among the experts” who try to persuade one another. It is taken for granted that a consensus among experts is the best guide to monetary policy-making we can have. Emphasis on a single rule as the basis for monetary policy implies that the truth has been found, despite the record over time of major shifts in monetary policy — from the gold standard, to the Bretton Woods fixed but changeable exchange rate rule, to Keynesian approaches, to monetary targeting, to the modern frameworks of inflation targeting and the dual mandate of the Fed, and more. We should not make our monetary policy decisions based on that assumption. Rather, we need our policymakers to be continually on the lookout for structural changes in the economy and for disturbances to the economy that come from hitherto unexpected sources. In this passage Fischer suggested that historical shifts in monetary policy fashion warn us against adopting a non-discretionary regime because they indicate that no “true” regime has been found. But how so? That governments during the First World War chose to abandon the gold standard (in order to print money to finance their war efforts), and that they subsequently failed to do what was necessary to return to a sustainable gold parity (devalue or deflate), does not imply that the mechanisms of the gold standard — rather than government policies that overrode them — must have failed. Observed changes in regimes and policies do not imply that each new policy was an improvement over its predecessor — unless we take it for granted that all changes were all wise adaptations to exogenously changing circumstances. Unless, that is, we assume that the experts guiding monetary policies have never yet failed us. Fischer further suggested that a monetary regime is not to be evaluated just by the economy’s performance, but by how policy is made: a regime is per se better the more it incorporates the latest scientific findings of experts about the current structure of the economy and the latest models of how policy can best respond to disturbances. If we accept this as true, then we need not pay much if any attention to the gold standard’s actual performance record. But if instead we are going to judge regimes largely by their performance, then replacing the automatic gold standard by the Federal Reserve’s ever-increasing discretion cannot simply be presumed a good thing. We need to consult the evidence. And the evidence since 1914 suggests otherwise. Contrary to Fischer, there is no good reason to presume that expert-guided monetary regimes get progressively better over time, because there is no filter for replacing mistaken experts with better experts. We have no test of the successful exercise of expertise in monetary policy (meaning, superiority at correctly diagnosing and treating exogenous monetary disturbances, while avoiding the introduction of money-supply disturbances) apart from ex post evaluation of performance. The Fed’s performance does not show continuous improvement. As previously noted, it doesn’t even show improvement over the pre-Fed regime in the US. A fair explanation for the Fed’s poor track record is Milton Friedman’s: the information necessary for successful expert guidance of monetary policy is simply not available in a timely fashion. Those who recognize this point will be open to considering the merits of moving, to quote the title a highly pertinent article by Leland B. Yeager, “toward forecast-free monetary institutions.” Experts who firmly believe in expert guidance of monetary policy, of course, will not recognize the point. They will accordingly overlook the successful track record of the automatic gold standard (without central bank management) as a forecast-free monetary institution. We live in an age of advanced monetary surrealism. In Q1 2017 alone, the largest central banks created the equivalent of almost USD 1,000 bn. worth of central bank money ex nihilo. Naturally the fresh currency was not used to fund philanthropic projects but to purchase financial securities1. Although this ongoing liquidity supernova has temporarily created an uneasy calm in financial markets, we are strongly convinced that the real costs of this monetary madness will reveal themselves down the line. We believe that the monetary tsunami created in the past years, consisting of a flood of central bank money and new debt, has created a dangerous illusion: the illusion of a carefree present at the expense of a fragile future. The frivolity displayed by many investors is for example reflected by record-low volatility in equities, which have acquired the nimbus of being without alternative, and is also highlighted by the minimal spreads on corporate and government bonds. Almost a decade of zero and negative interest rates has atomised any form of risk aversion. While the quantitative easing programmes are still going at full throttle in many places without the media paying much attention, the situation in the USA looks decidedly different: seven years after the Fed funds rate had been set to zero, the first interest rate hike by the Federal Reserve in December 2015 marked the end of the longest period of immobility in terms of interest rate policy in history. To many market participants, this overdue step towards normalising the monetary policy is the confirmation of the much-desired comeback of the US economy. We believe that the absence of the often-quoted sustainable economic recovery is one factor to blame for the passivity of the Fed. The depreciation of the Chinese currency and the still falling yields at the long end of the yield curve in 2016 are two others, as a result of which the Fed had to procrastinate until December 2016. The gold price celebrated a remarkable comeback during this hesitant phase of the Fed. Last year we confidently opened the “In Gold We Trust” report with the line “Gold is back!”. We had anticipated the passivity of the Fed as well as the return of the bull market. The gold price seemed to have experienced a sustainable trend reversal in USD, and we felt our bullish stance had just been confirmed. But our gold(en) optimism was stopped in its tracks again in autumn 2016. The gold price declined significantly, in particular in the last quarter of 2016, even though the maximum drawdown has never exceeded 20%. We can therefore still call the status quo a correction within the confines of a new bull market, but we want to openly admit that we had not foreseen the dent in the gold price performance. Our target price of USD 2,300 for June 2018 may therefore prove overly optimistic. But what was the trigger of the sudden reverse thrust of the gold price? Ironically, it was Donald J. Trump. The election of the presidential candidate originally unloved by Wall Street fuelled hopes of a renaissance of America on the basis of a nationalistic growth policy. President Trump brought about a change in sentiment, especially among a class of society that had lost its trust in the economic system and political institutions. Stocks received another boost, and the increase in the gold price was (temporarily) halted. The Fed seems to be keen to use the new euphoria on the markets in order to push the normalisation of monetary policy. Even if the journalistic mainstream is abundantly convinced of the sustainability of the US interest rate reversal, a contradiction is embedded in the narrative of the economic upswing triggered by Trump: if the economic development, as claimed by the Fed in the past years, was actually rosy even prior to Trump’s victory, the candidate promising in his central message to make America great AGAIN would presumably not have won. The narrative of a recovering US economy is the basis of the bull market in equities. The valuation level of the US equity market is nowadays ambitious, to put it mildly – both in absolute numbers and in terms of the economic output. This prompts the conclusion that the U.S. is caught up for the third time within two decades in an illusionary bubble economy created by money supply inflation and equipped with an expiry date. In comparison with the earlier two bubbles, however, the excess is not limited to certain sectors (technology in 2000, credit in 2008), but it is omnipresent and includes various asset classes, especially also bonds and (again) property. In view of the current situation, the renowned analyst Jesse Felder rightly talks about an “Everything Bubble”.4 From our point of view, the concept of the classic investment portfolio, which calls for shares to satisfy the risk appetite and bonds as safety net, must be critically questioned. While markets are already celebrating the future successes of Trumponomics, the structural weakness of the US real economy is revealed yet again in the latest growth figures. According to the most recent estimate, the US economy expanded in Q1 2017 by a meagre 1.2 % y/y. In combination with an inflation rate of more than 2%, this means that the U.S. is at the edge of stagflation – a scenario we have warned about on several prior occasions. But markets are obviously taking a different view than we are. At least for now. Moreover, the ratio of real assets to financial assets is currently the lowest since 1925.5 In a study worth reading, Michael Hartnett, chief strategist at Bank of America Merrill Lynch, recommends to “get real”, i.e. to reallocate investments from financial assets into real assets.